The Tribune finally has acknowledged there are those out there with alternative ideas for how to fund our roads and transportation needs. Thanks to Mike Salinero for his Tampa Tribune article yesterday titled Surprise Hillsborough transportation plan came straight from anti-tax advocates. It's about time the Tribune start publicizing what we have been saying publicly for the last year and half. The irony is Salinero and the Tribune are so in the tank for a sales tax hike they have refused to acknowledge any other funding options. Why should they have an issue with Commissioner Murman deciding it was beyond time to finally have that conversation? Salinero never called Mark or myself about this article so of course he left out some important points. Salinero does not acknowledge we have for years consistently and publicly been asking the county to re-prioritize our current budget to appropriately fund our roads. He does not acknowledge that we have consistently advocated and been on the record for additional funding options other than just the sale tax hike proposed by Go Hillsborough. Salinero also does not acknowledge that we have been offering funding alternatives to an unnecessary sales tax hike long before Murman ever presented her alternative funding plan. The Eye posted Hillsborough PLG: Where is Plan B? on July 12, 2015. We also posted Here's a Plan B back on October 3. Mark handed the Plan B to ALL the county commissioners when he made a public comment about it at the October 7, 2015 county commission meeting. We came up with a Plan B for free. The county paid Parsons Brinckerhoff and politically well connected Beth Leytham $1.3 million taxpayer dollars. All they came up with was one proposed funding option, Parsons standard template - a run of the mill sales tax hike. Why? 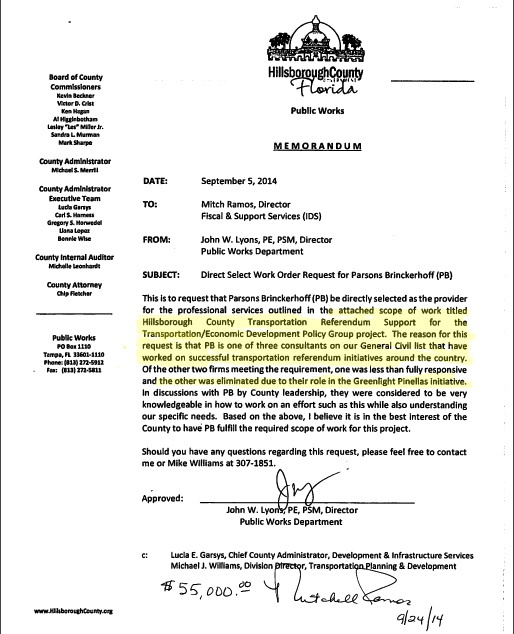 Because that was the answer Parsons/Leytham was expected to deliver since Parsons was awarded, via a no bid contract, a scope of work titled "Hillsborough County Transportation Referendum Support. We don't ever remember the Tribune or Salinero questioning this. Even Salinero's Tribune pal Joe Henderson stated it is time for a Plan B, C, D, E, F….when both Joe and I were on Florida This Week back in September. Salinero's public records request apparently did not go back far enough or target all the right people. He missed the unsolicited call I received from former county commissioner Mark Sharpe in early 2014 asking for our input on the transportation initiative. It was Sharpe who got us formally involved in the transportation issue long ago. As citizens, we all have the right to contact our elected officials, meet with them and speak to them about important issues. I regularly advocate for citizens to contact our county commissioners, talk to them and establish a relationship with them. That's how our participatory form of government is supposed to work. We know the special interests and politically well connected meet and speak with the commissioners all the time. We all now know about the politically well connected PR lobbyist Beth Leytham's influence. She's the one that got caught orchestrating behind the scenes outside of Sunshine and with NO transparency at the same time she was receiving hundreds of thousands of taxpayer dollars. The fact is everything we have advocated for is very public knowledge. We have not been paid a dime and have never asked for anything in return. We are simply concerned citizens voicing our opinions. Is Salinero and the Tribune trying to make the transportation issue about who spoke to who? Then Salinero should get all the phone records of the pro sales tax hike transit advocates and special interests who have contacted any of the commissioners over the last 2 years on the transportation issue. While he's at it Salinero should get all the phone records and text messages between Beth Leytham and any county commissioner or Mike Merrill. We anxiously await that report. Salinero had the courtesy to call Ken Roberts and Tom Rask for this article. Next time Salinero wants to write about me he should call me first so he can get his story straight.